If you refer to yourself as a true outdoorsman, then it goes without saying that you know how important it is to have a reliable timekeeping tool with you. When you are outdoors, a standard watch just won’t cut it. You need the most advanced, versatile and the toughest timepiece while in the wild. Don’t you agree? However, shopping for a good, reliable outdoor watch can be quite a hassle. Most beginners won’t even know where to start. In this article, we will give you some great tips on how to shop for the best outdoor watches. For good measure, we have also thrown some great recommendations for you. Most outdoor activities consist of different adventures and so one of the first things you must do before buying a watch for the outdoors is to make a list of the features you would want for each activity. For example, for hiking you will need certain features that will help you on the trail. For running you will need other features such as the tracking metrics that can track your heart rate as you jog. If you are doing deep sea diving, you will need an outdoor water resistant watch that can still keep working when you are deep under water. Therefore, be specific about the type of outdoor activity you will be taking on when you are buying a watch to compliment the outdoors and you will find life much easier. Money is a major issue that you need to consider when you are thinking of buying a great watch for your outdoor activities. A watch that comes with the major equipment might not be cheap but it will definitely do its job well. It will help to keep you safe outdoors because of special features it has such as the capability of keeping track of how fast your heart is beating, GPS tracking that makes it easier for you to navigate your route and so on. Therefore, consider your budget and buy an outdoor timepiece that fits in well with what you can afford. How long your timepiece can work is essential when you are outdoors, especially if you are considering such dangerous sports as rock climbing and deep sea dives. No one wants to take a watch along with him or her only to see it stop working in the time when it is really needed. You cannot access the badly needed features the watch carries when the battery runs out. So therefore, you will be left on a limb hanging with no way of checking your heart rate or breathing and so on. To make it safer for you when you are outside hiking, running or camping in the wild, buy a watch that has a long battery life. Durability is a necessary factor when buying a watch to keep you company while hiking or camping out. To be honest, most manufacturers put durability as one of the most outstanding features in outdoor watches. However, it is to your best interest that you buy a timepiece that can take the pressure and stress of outdoor life and not buy one that will crank up on you at the least little bounce it gets. After all, some of the activities you might be participating in may have to do with rugged terrains and so you need a timekeeper that can keep up with you every step of the way. The type of watch you wear when you go hiking or camping can make a difference to your outdoors adventure, especially if you fancy yourself to be an avid out-of-doors devotee. So, below are some top-notch outdoor watches you should consider owning if you are a passionate outdoors person. The Casio Pro Trek Watch comes with an array of features that you will love. Although the original color is usually led white, the watch can come in slightly different color variations. In addition, it has a triple sensor feature attached to it so that you can always get thorough barometric pressure readings. The beeper alarm will sound the signal and will show light-up digital display on the indicator. Furthermore, there is a dual led feature that will cause the watch face to illuminate so that the digital display can be seen properly. Other features that make this watch suitable hiking watch to own is its operating functions such as the tough solar, smart access and a radio controlled timekeeping device that truly makes it the best hiking watch worn by outdoor enthusiasts today. Related: Customers who buy this great watch also buy the Casio Tempered Glass Screen Protector. It has been specially made for Casio watches and provides full coverage and will ensure your watch does not get damaged during your day to day activities. The Garmin Epix GPS Watch is a timepiece every outdoor lover should own. As the name GPS implies, the watch has mapping devices to help you navigate the great outdoors. Although it looks a bit bulky at first glance, still, it is a comfortable fit on your wrist and once you put it on you will want to wear it every single day. Some of the watch’s top features are its 164 foots water resistant capability that allows you to take a nice swim without taking it off, touch sensitive screen, backlight, menu, configurations and power off option as well as activity history details that allow you to backtrack and see what your recent activities were. 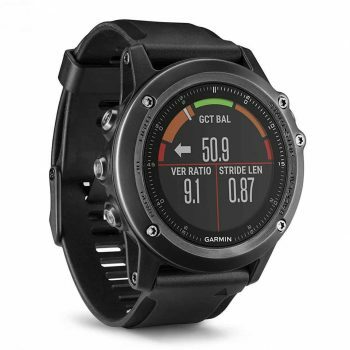 An outstanding feature of this watch is its Garmin Connect Website that operates through the Smartphone app. The app allows you to set the kind of goals you want when you are outdoors and as an additional bonus you can use it to share information with friends. Related: Customers who buy this watch also buy the Garmin Epix Fabric Wrist Band. In case your wrist band fails you, it’s good to know that you have a reserved one. Unlike most outdoor watches worn by nature lovers, the Garmin Vivoactive Watch timepiece is more like a fitness watch when compared to other Garmin forerunner watches. It carries in its array of features a GPS tracking device that allows you to stay on course when you are traversing the outdoor scenes. However, its most awesome attraction is its color screen, which is an LCD panel measuring 204 by 148 pixel. The screen’s glare is awesome during sunlight hours but works with a front light at night. Still, if you find yourself in a dark spot when outdoors, you can always manually turn on the light or better yet allow the light to automatically come on when you use the Vivoactive. To make the watch remain on your wrist, it carries strap screws that are invisible to the eye. It is light and can fit very comfortable on your wrist. What better way to face the outdoors than to wear the Garmin Vivoactive Black timepiece on your person. 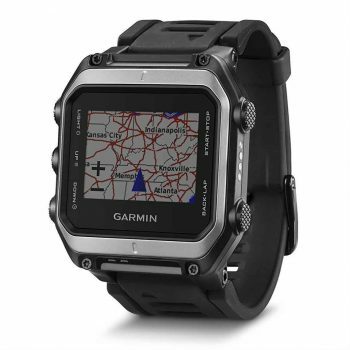 Related: Customers who buy this Garmin watch also buy the Garmin Vivoactive Screen Protector which of course, protects their watch from all sorts of bumps and scratches. 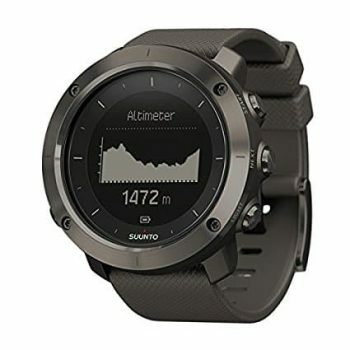 The Suunto Traverse Watch was released in 2015 and since then has been making a splash on the market. 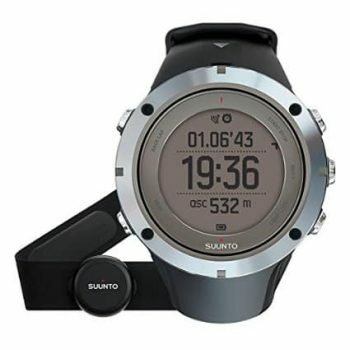 The watches comprise of five collections and they include the Suunto Traverse Amber, White, Black, Slate and Graphite. Apart from their awesome features, they tend to look attractive on the wrist of their owners. The casing for the watch is made of stainless steel and the watch itself carries a weight of 2.9 ounces. It has a 328 foots water resistance capability. The lenses are made from mineral crystal that makes it difficult to bend under certain kind of pressure. To top it all, on the inside of the timepiece there is a barometer, digital compass, altimeter, thermometer and GPS tracking system attached to it. The outside of the watch is designed to withstand severe conditions. For your outdoor adventures, choose a timepiece that can go the distance such as this watch and thus you will have all the tools you will need when it comes to keeping proper time in the great outdoors. Related: With a smart watch such as this, you need to have the right accessories. That is why customers also buy the Zeagle Stiletto Package. The package comes with 5 different items which you will certainly need in your day to day living. 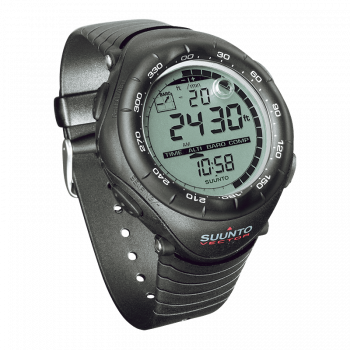 The Suunto Vector Watch is a great outdoor watch to own! It has everything you need to give you that edge when you are tackling the outdoors. It is mainly designed for mountain trails and climbing. With an altimeter, compass and barometer systems as part of its inside attachments, you will have no problem keeping good time and finding your way around the mountain. In addition, the design of the timepiece makes it durable so that you can tackle the harshest conditions outdoors. Other key features include temperature keeping, altitude log, vertical speed, weather trend indicator, altitude difference measurement, multiple watch use, user replaceable battery and date as well as a cool timepiece. This watch is designed for professional outdoor enthusiasts to wear so they can tackle the harsh conditions of the great outdoors. Related: Another fitness item that will help you alongside this watch is the 3D FitBud Simple Step Counter. It has a lanyard so you can easily hang it as you go. Without the Casio Pathfinder Watch available to outdoor lovers, life in the great unknown would not be always so enjoyable. It has a solar fuel power attribute and is created to run for up to six months without the help of any sunlight. 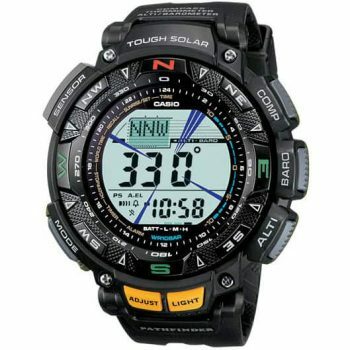 Its capabilities are worth noting and features consist of an altimeter, time performance piece, barometer, compass, thermometer, solar power and an easy to use display section. This is an attractive military watch for the outdoors that carries a cutting edge to it. With an affordable price tag, an array of features, functions and outstanding performances, your outdoor adventures could not be any better. Related: Customers who buy this watch also buy the Casio Replacement Band. Enough said, it’s always good to have a replacement band in case your current one gives up on you. Having the Suunto Ambit 3 Peak Sapphire Watch as your traveling companion when you are outdoors is a dream came true. It can be used as a sports watch and today many sportsmen are depending on it mainly because of its awesome performance record. It has all the features that you will need to make your time outdoors a pleasant one. 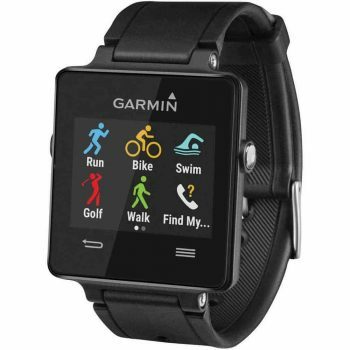 Key features include heart rate reading, mobile connections, GPS and weather functions. Other powerfeatures include a compass, altitude, 30 hour battery usage, track back and navigation, activity recovery time, speed, distance and pace movement and language choice as well as more. In addition, it is good for connectivity purpose and you can upload as well as share your activities with friends or family members in other locations. The connectivity system also gives you the ability to see your messages and calls as well as you can see notifications. Furthermore, you can take memorable photos and send them to friends or record those unforgettable outdoor experiences and share then on social media sites. To enjoy your outdoor visits more, you can wear a Garmin Fenix 3 Watch timepiece so that you can keep abreast of the time of day and take advantage of other top features that the watch has to offer. You can use it for any outdoor activities such as to track your biking, running, rowing hiking, triathlon, climbing, snow skiing, stand up paddling, swimming, golfing and airplane skydiving as well as more. The watch is rather chunky built and really stands out as rugged, yet, it looks attractive on the wrist. This famous timepiece packs enough features to stand up to any outdoor watch competing against it. One feature that it boasts very well is the tracking metrics, which is used to track your breathing when cycling, running, swimming, hiking, skiing, hunting, paddle rowing, golfing, working out at the gym and much more. The heart rate monitoring is another essential feature to have when you tackle the outdoors because it allows you to keep track of the pace your heart is beating when you are outside doing outdoor activities. Another cool feature is the activity tracking that makes it possible for you to track what you do during the days when you are outdoors. The notifications app is another tremendous feature to carry around with you because you can see who is trying to get you on your Smartphone anytime of the day. The battery life of this watch is to be commended as well because the GPS can function properly for up to 16 hours nonstop. The UltraTrac training can go up to 40 hours and the smart watch can continue working for up to two weeks straight. What better way to conduct your outdoor activities than to have this watch as your companion. Related: Customers also buy it with the Garmin Fenix 3Screen Protector and the Garmin Fenix 3 Watch Band. These items are specially made for this watch and will serve you a great deal. Owning a good outdoor watch will allow you to stand out from the crowd of hikers and campers. Not only that, but the watch you wear when you are doing your strenuous outdoor activities will help you stay in touch with the outside world and make you feel in control at the same time. So what do you think of these featured outdoor watches? Do you have one that doesn’t belong in this list? Sound off in the comments!